On the news last night they showed a nearby Best Buy parking lot where several insane people had been lined up down the sidewalk since yesterday morning (and some apparently since Tuesday!) awaiting the store to open last night at midnight. A few had even pitched their tents. Is that even legal? They were all after that t.v. advertised for $199. All I can say is, I'd hate to have been there when they ran out. I would not go out into that mob of blood thirsty bargain hunters if I was guaranteed a free t.v.. I prefer to do the majority of my Christmas shopping with the click of a tiny mouse while enjoying my amaretto flavored Folgers in my pajamas, complete with bare feet, bedhead, and a couple of lazy Dachshunds by my side. And speaking of the lazy Dachshunds, at least one of them...ahem...Brisco Darling!...was a very bad little wiener while we were away for Thanksgiving dinner yesterday. Turns out he somehow got the memo about Thanksgiving being a day for getting your gluttony on because he managed to get into the cabinet and drag the trash can out from under the kitchen sink and proceed to feast on a buttload of old leftover chicken breasts and boneless pork chops that Charlie threw away yesterday morning. I told him he was a very bad little wiener so he rolled over onto his back and gave me his best "I'm so sorry" look with his belly bulging on both sides and resembling a prized cantaloupe. And then he politely put himself to bed at 9pm. I, on the other hand, have succeeded at making it through two Thanksgiving get-togethers while only eating one piece of dessert, key lime pie. If I ever turn down a piece of key lime pie, call 911 because I'm either deathly ill or my body has been taken over by an alien life form. It just doesn't happen. I'm quite sure, however, that I more than made up for the calories I didn't consume in pie by inhaling countless spoonfuls of Nutella that I've been sneaking out of the kitchen cabinet for the past week. I had somehow managed, in my forty years of life, to escape the highly addictive, mouth watering, magical deliciousness that is Nutella. I blame Pinterest. For all those seductive Nutella-containing recipes. And the grocery store. For putting it right there beside the peanut butter. Because I am now in need of a good Nutella Rehab. So if you know of one, please send me their contact information asap. In other Thanksgiving news, the boys left out last night for a two day hunting trip with their popaw, uncle, and cousin. They had asked yesterday morning if they could take their BB guns with them to which we reluctantly said yes to. But we promptly changed that to a no after I was popped in the mouth by a Nerf dart while minding my own business in Charlie's dad's living room yesterday afternoon. I shouted out, "I WILL KILL YOU!" before I even realized what or whom had shot me. Not my proudest mom moment but what can I say? It just came out. The guilty party aka the Dracenator/Idea Man began apologizing profusely and nearly had a complete meltdown once we informed him that he would not be taking his BB gun along on his hunting trip. He insisted that he really only meant to shoot Charlie in the shoulder and instead accidentally hit me in the mouth. And I explained to hit what would happen if he were to "accidentally" pop someone in the eye with his BB gun. At the threat of not going on the trip at all, he reluctantly sucked it up and piped down. She politely answered the phone when she was blasted by a man shouting that he had a new baby who would NOT, for the love of God, STOP crying, that he had been up ALL night long, had missed his ever-lovin' plane and that THAT G.D. PILSBURY DOUGHBOY HAD EXPLODED AND COOKED ALL OVER THE INSIDE OF THEIR NEW REFRIGERATOR THAT WAS AS HOT AS AN OVEN AND THAT HE WANTED SOMEBODY OUT THERE ASAP!!!! Turns out the compressor on the refrigerator had been installed backwards and it was cooking their food. I did not even know that was possible. She and two other employees ended up going out to the house where she was put in charge of watching the baby that wouldn't stop crying while the mess was cleaned up, the refrigerator was fixed and the wife went grocery shopping. Now if y'all will excuse me, I probably should think about getting dressed since it is now noon and I'm still sitting here in my pajamas beside the bad little dumpster diving wiener dog who is now producing some extremely foul smelling gas! I sent RY out last night about 11. We need 3 Itouch so ToysRUs had a $50 gift card if you buy one. That would have given us 3 for a little more than the price of 2. He had to park at the next parking lot over. He had to stand in line. There were police there. He said it was crazy! Are you surprised to hear they were out? So, he went to Walmart to see if they would "match it". After standing in line outside the building, he was told "no". I guess I'll have to try to get by a Target this weekend:) They are supposed to be giving a $40 gift card with Itouch purchase. The only reason I want the stupid gift card is that I'm a little concerned about the kids only having one present to open Christmas day because the Itouch is so stinking expensive! Can you even imagine your fridge cooking stuff? The smell must have been horendous! I would not cross the border on Black Friday if my life depended on it. I've heard some pretty nasty stuff. And the dog...well played dog...well played. PS. Am I the only one who doesn't like Nutella? Yes, I decided that there is NO WAY one will be able to get me to go in public today. I even feel tentative about tomorrow... but, we are almost out of toilet paper. Sooo... we'll see. Amen, girlfriend. I'd hate to be sentenced 20 to life for murdering some crazy heifer, and mess up my kids' Christmas! I thought about it briefly when I caught a glimpse of a $59 DVD player, but then I realized that we already HAVE 3 DVD players. Walmart likes to mess with my emotions. Instead, I scored some great Old Navy deals online and some crazy WWE Smackdown steal cage from walmart.com. It seemed important at the time, but it has since occurred to me that he doesn't even WATCH wrestling!! Shoot me now, please. My granddog was visiting and managed to eat an entire cheese and meat platter. His belly was so big that he looked more like a just fed snake than a pound puppie rotweiler mix. Happy Thanksgiving. I love reading about you and your boys. Brings back great memories. Walmart is SO scary. Apparently there was a fight over the $2 waffle makers they had on Black Friday.. When I was pregnant with Oldest, I went for a get away down in the Florida keys (We lived about an hour away). There was this little diner in the inn we satyed in, and they made key lime pie from the key lime trees in the front yard. Lord help me, it was all I needed to become forver addicted. Now, nuttella. I have not yet indulged. I can only imagine the results would be bad. Really bad. Oh Lord... I am cracking up and totally impressed at the Sears story. I can't imagine answering that phone call! Excuse me... must go look for the Nutella I hid from myself. That Sears story was a good one! And you are right about the Nutella stuff. It is highly addictive! Thank you for your recent visit to my Rock4Today blog. I promise that all posts won't be that dramatic! 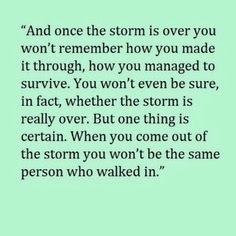 God bless and comfort you in your own journey through grief. 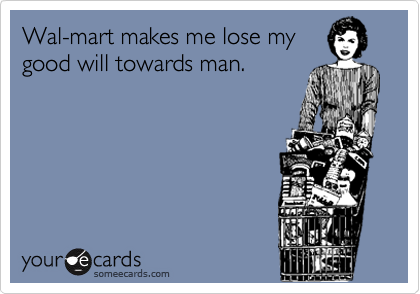 That Walmart quote is so true! I am a nutella addict!